YUMS! 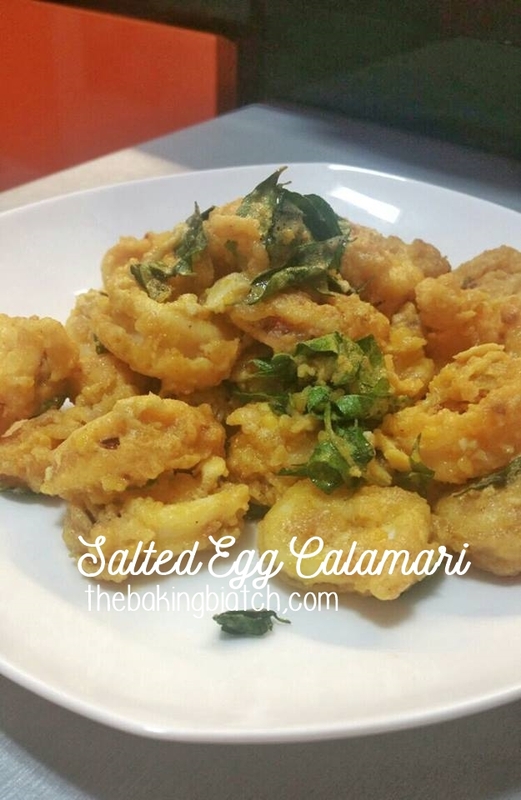 Last week, I cooked some Salted Egg Pork Ribs.. today, I had the idea of cooking them in calamari style since I found some fresh ones in the supermarket. I also made improvements to the batter and boy is it delicious! The recipe takes about 30 mins to prepare and cook and I'd rate it a difficulty level 3 out of 5. 1. Clean the squid and dry them. 2. Slice squid into 2 - 3cm rings. 3. Dry the rings further with some kitchen towel. 4. Whisk the eggs in a bowl. 5. In a bowl, mix all the dry ingredients together. 6. Dip the squid into the egg mixture. 7. Dip the squid in the dry flour mixture. 8. Deep fry in hot oil (medium to medium-high heat) till golden brown. 9. Remove from heat and set aside. 10. In a frying pan, melt butter on low heat. 11. Add curry leaves and stir fry till fragrant. 13. Add calamari and toss.